crane – my patron saint – Hello Korea ! 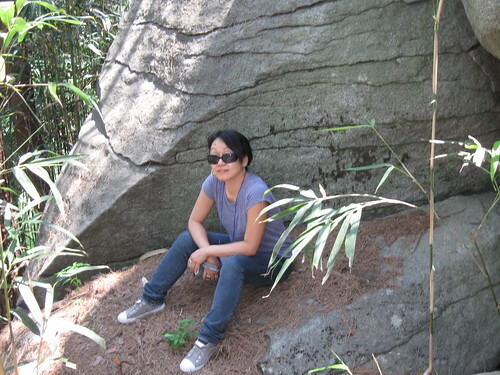 Here I sit at Hakbaui, which is “crane rock.” As I was listening to the story (below) of why this rock was so special, I of course had to marvel that the first and only time I’ve been out hiking in Korea, it leads me here of all places. A gentleman’s daughter was living in Haksan, and one day, she went to Seokcheon well for water. She drank the water from a bucket upon which the sunlight is brightly reflected, and she gave unexpected birth to a baby. She felt ashamed that an unmarried woman had given birth to a child so that she wrapped the baby up and threw him away at the Hakbaui. A few days later, the lady went back to Hakbaui and found a white crane came there to cover the boy with its wings, and in the early morning the crane put a red-colored fruit into the baby’s mouth and disappeared. She realized the infant was no ordinary child and raised him. The baby became a Buddist priest and attained the highest position of Guksa (National Priest). After returning to Haksan, he constructed Gulsansa Temple. Hakbaui is known as the place where Boemil (810-889) a main god in the Gangnueng Danoje Festival, was thrown away when he was born without a father. The tale of birth for Boemil Guksa (National Priest) involving Seokcheon and Hakbaui is portrayed in Jodangjib of “Samgukyusas (The Story of the Three Kingdoms)’ and in the local history of Gangneung written by “Imyeongji’. So here I sit, in a country where they used to let their unwanted children die of exposure, at a place where an abandoned baby got a second chance at life by some mythical crane. In Gangnueng, they so revered this Buddist Priest that they deified him in their shamanistic rituals. See Korea? abandoned babies have great potential. And mothers should raise them, even if a miracle crane doesn’t appear.